Windsor Lane inspires the sensations of fresh air and crisp linen with its relaxed yet classic design in an easy Weathered Grey finish. Accented by warm bronze hardware, the collection features serpentine arched shapes on the mirror and bed crafted in quarter cut primavera veneers. 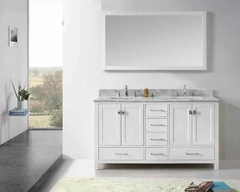 The casual yet traditional style includes rounded pilasters and tops partnered with classic raised panel door and drawer fronts. The unique door and drawer configurations create maximum storage and utility while resting atop handsome bracket feet. All drawers are tinted with English dovetail in the front and French in back. 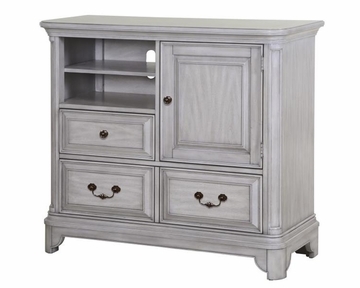 Media Chest features 2 drawers with appearance of 3 drawers, 1 door on the right and 2 adjustable shelves.